The holidays are coming! That means hosting parties, making lots of food, house guests, and lots of good memories! But it also means, you need to get your house ready! Agh! As a designer, and probably for anyone else in the interiors business, this time of year gets very demanding. Everyone has been traveling all summer and, once school gets into a steady swing in the early fall, they realize their house isn't ready for all of the guests they have coming and they want it to get done, FAST! If you've hired someone to work on your home but they may not be able to have it all done in time, here are some tips you can use to spruce it up yourself. A beautifully decorated home is nice to be able to present to guests upon arrival, however, a comfortable home is most important! People will remember how they felt in your home more than what it looked like, so hopefully these tips will help make your upcoming guest more comfortable! Add layers! A rug, some pillows, throw blankets, even small side tables contribute to the layers of a room. 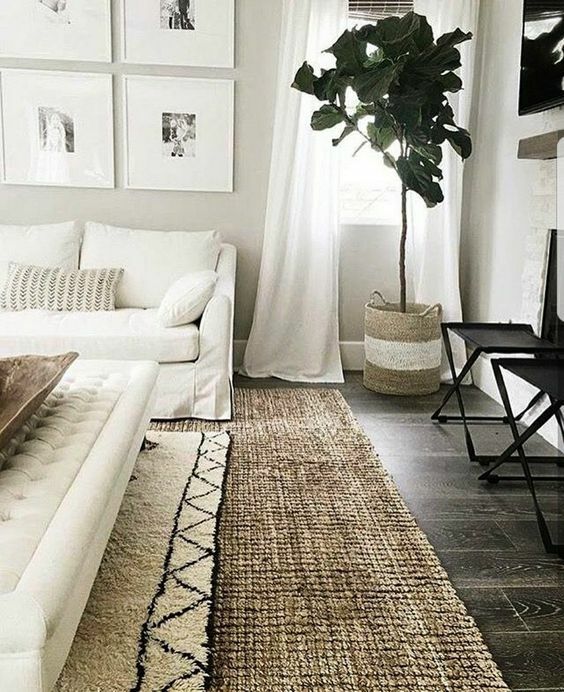 If you've got a soft place underfoot and some great pillows and blankets for guests to cuddle up with, they'll feel right at home and will be able to relax in your space. When selecting these items, think big. Bigger rugs are always better because, believe it or not, they make a space feel larger. A rug defines the space so a small rug places the outline around a smaller area, making the room feel less than it is. So go with the larger rug. Get big fluffy pillows too. And a lot. Layer and mix and have extras floating around that can be used for the floor so guests can really get comfortable. Hang some art. Art on the walls makes rooms feel more finished. If you don't have a lot of decorative paintings or special art you want to display, opt for a gallery wall of family photos or even some of the kids' art. There are tons of websites that allow you to purchase prints that can instantly be downloaded, printed, and framed, and allow you to fill in gaps if you're short on pictures. Bring in some lamp lighting. Floor lamps and table lamps add a different lighting layer that is warmer than overhead fixtures. It also gives guests more control of their light because they can just turn one on while the rest are off. If you have a small space where you'd be open to string lights, they give off a super warm glow and will make any guest feel at home. If your home doesn't have a good flow for guests, consider rearranging the furniture layout to make it more conducive to hosting more people. Bring in extra chairs, set up small seating areas, pull up the side tables for drinks, and allow your guests to be able to really enjoy! Ultimately, the holiday are a time for you to enjoy family, friends, and good food so don't let an imperfect home ruin your experience. Hopefully these little tips will help you prepare and will be remembered when you're throwing together all of those last minute preparations before the swarm arrives!